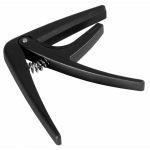 There are capo designs, but most commercial capos consist of a rubber-covered bar that clamps to the instrument's neck in some way to hold down the strings. 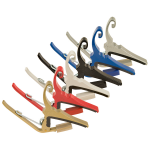 Capos come in different sizes and shapes for different instruments and fretboard curvatures. The most relevant mechanical factors that vary by type of capo are ease of use, size, degree of interference with the player's hands, and ability to hold down strings uniformly without affecting tuning. AROMA AC-01 Guitar capo. Total metal material. Quality steel spring. Perfect silicon cushion. Easy to put on and remove.